Mazda CX-5 Performance, Engine, Ride, Handling | What Car? Focusing solely on performance, the diesel engines are more impressive than the petrol. Even the entry-level 148bhp diesel (badged Skyactiv-D 150) pulls hard from 1100rpm all the way to the redline, so it actually feels more like a turbocharged petrol than a diesel. The more expensive 181bhp diesel (Skyactiv-D 184) is that bit stronger at the top of the rev range, but unless you’ve got the car packed to the brim with people and luggage, the difference isn't that noticeable. That's partly because this more powerful diesel is available only with four-wheel drive, which adds a fair bit of weight. What about those who prefer petrol? Well, a 2.0-litre engine (Skyactiv-G 165) is your only option. Unlike nearly every other modern petrol engine, it doesn't have a turbocharger, so you need to rev it really hard to get the best from it. Mind you, there’s just about enough low-rev oomph to help you make easy, relaxing progress – as long as you aren't in a hurry. The relatively stiff suspension that helps the CX-5 handle well (see below) doesn’t do much for ride comfort. It’s certainly more jarring over sharp-edged bumps than, say, the Peugeot 5008 or a Honda CR-V, and never really settles on the motorway, either. It's one of the CX-5's few weak points. With this in mind, we'd suggest sticking with smaller 17in alloys (standard on SE-L Nav+ trim) and avoiding the 19in wheels fitted to range-topping models. The slightly larger tyre sidewalls on the smaller wheel help take the sting out of potholes and other nasty obstacles. 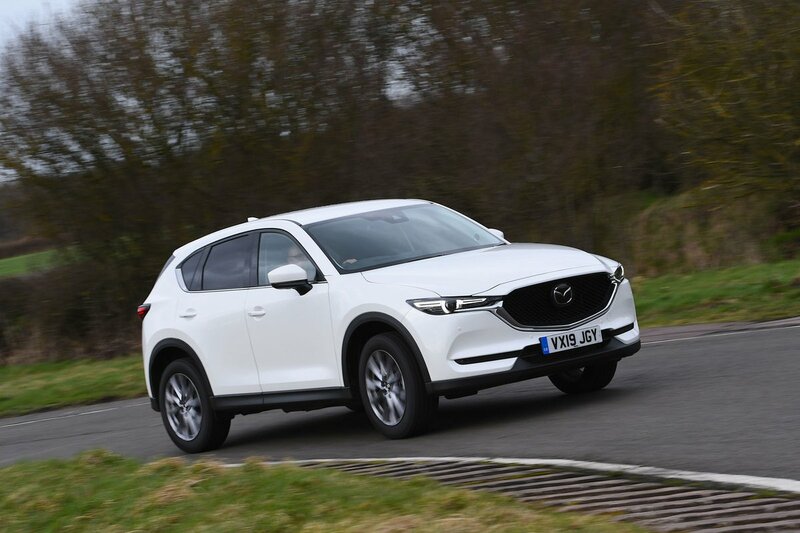 Compared with the Kodiaq and CR-V, the CX-5 handles really quite well – especially on the larger 19in alloys that come as standard on Sport Nav+ and GT Sport Nav+ trims. 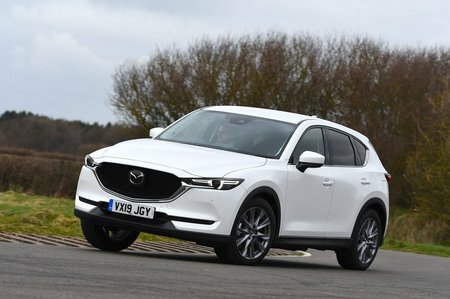 There's plenty of grip and the CX-5 provides more feedback through its steering than most rivals, and is therefore more enjoyable to drive along a typical country road. Body lean is also relatively well contained, although don't expect to fly around corners quite as quickly as you'd be able to in a family hatchback such as the Ford Focus or Volkswagen Golf. Smaller SUV rivals, such as the Seat Ateca, are also more agile. There's a bit of road noise on cars fitted with the biggest biggest 19in wheels, but this is also a criticism of many rivals, including the CR-V and Toyota RAV4. True, the Kodiaq and Peugeot 5008 are quieter motorway cruisers, but only marginally. 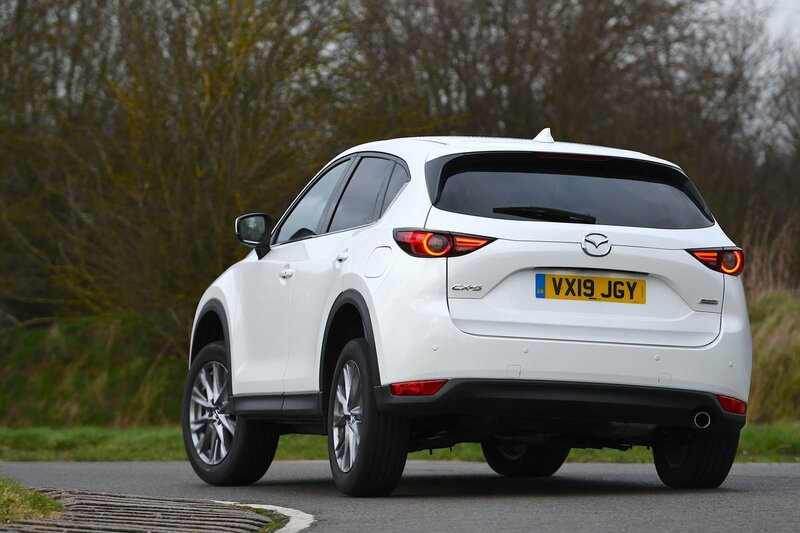 The CX-5's diesel engines are smooth, even when worked hard, even if they do sound a bit gruff at very low revs. The fact that you need to work the petrol engine harder makes it altogether rowdier companion. The standard six-speed manual gearbox is a bit stiff but has a relatively sporty, precise action, while the optional automatic 'box changes gears smoothly on the move and isn't at all jerky when you're parking.